Review: "OHMphrey: Post Haste" - Sea of Tranquility - The Web Destination for Progressive Music! 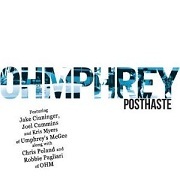 Post Haste is the second Magna Carta release from OHMphrey, which for those not aware is the coming together of guitarist Chris Poland & bassist Robbie Pagliari, both from instrumental fusion act OHM, with jam/prog band Umphrey's McGee members Kris Myers (drums), Jake Cinniger (guitar), and Joel Cummins (keyboards). Their 2009 self-titled release was a spirited affair that mixed prog, jazz-fusion, metal, and jam styles, and Post Haste takes that formula one step further, as the band has had more time to gel together and the end result is an even more satisfying release. What's interesting to note is that even though Poland is mostly known for his work in Megadeth back in the 80's, he cut his teeth on fusion before that and in recent years has perfected his craft with OHM. Cinniger on the other hand makes his paycheck playing jam band material in Umphrey's McGee, but his secret love is metal and prog rock. Put these two together and some magic is being created here. That's not to say that Post Haste is a shred fest, not by any means. It would have been easy for these two and the rest of the band to churn out a CD filled with non stop noodling and solos, but there are actual songs on display here. "The River Runs" shifts, toils, and boils, with heavy riffs underpinned by sinewy bass lines, gorgeous piano, and blazing liquid guitar lines, while "Tom Bombadil" and "The Sun Also Rises" feature funky arrangements that mix both the prog and the fusion. "The Shoemaker's Back" sees the band launch into atmospheric & metallic avenues that are like a cross between Umphrey's McGee, The Dixie Dregs, Meshuggah, and The Grateful Dead, complete with some truly soaring guitar lines. Look for some really funky picking on "Ramona's Car Wash" (Little Feat fans rejoice! ), and "Reggaelic" is a spacey reggae piece filled with sumptuous keys from Cummins and plenty of tasty melodic guitar solos. The two guitar masters really get into some fiery interplay on the jam/fusion gem "Firestarter", and the closing 20 minute epic "20/20" is a jam of monstrous proportions, as Myers & Pagliari lock into a serious groove over which Cummins lays down some colors and Poland & Cinniger get their freak on. From a chops perspective, this is some impressive stuff. Full of groove, chops, and melody, Post Haste is a meeting of some star musicians that works on every level. No doubt these guys must be mindblowing in a live setting, so if they happen to squeeze in some live shows amidst their otherwise busy schedules, check 'em out if you have the opportunity and hear some of these songs on stage.